LENGTH X WIDTH X HEIGHT: 159.8 x 67.5 x 58.7 in. CARGO CAPACITY: 17.1 cu. ft.
BOTTOM LINE: As the smallest of the Prius variants, the c is intended for city driving and as such isn’t totally comfortable on the highway. Because of its long history and its sales volume, the Toyota Prius is the benchmark among dedicated hybrids. Among its many variants you won’t find a performance Prius, but you will find all versions of the base Prius. Our tester is the Prius c, originally intended to be the “city” version. As such it is slightly smaller in size than its cohorts, with a more conservative engine. It still offers outstanding fuel economy. Also, our tester is the Prius c Four, the top-of-the-line among Prius c’s four grades. And the most expensive. Prius c’s range from a base of $20,630 for the One to $24,995 for the Four. However, even in the Four, power is modest from the 1.5-liter four at 73 horsepower and 82 lb.-ft. of torque. With the combination of the gasoline and electric combined, acceleration is decent, and power is acceptable. The engine tends to be a bit noisy at time, though. 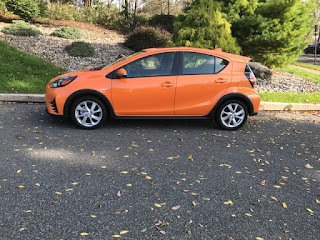 We took the Prius c on a turnpike trip with some fun local driving at the end. Our tester was a bright orange (Tangerine Splash Pearl, a $395 option), so there was no fear that we might be overlooked by the big semis. It was also easy to find in parking lots. There’s no mistaking this car for a Prius. The front end is the same as all the others with Toyota touches. The hatchback rear is reminiscent of a crossover, giving the c good cargo capacity (17.1 cubic feet) for a small car. In general, we found the cargo capacity to be adequate, but a trip to Costco forced us to lower the rear seat backs. Front seats are comfortable. There’s a nice shelf in front of the passenger that’s great for phones. It even has USB and AUX outlets in it. The two cupholders are inconveniently located at the base of the center stack which can make it difficult for tall cups. The center console/arm rest is small, in keeping with the car’s compact size. Prius dash design has come a long way. Instead of a huge blank panel facing the driver, there is now some design there. The instrument panel is centrally located atop the dash with a digital speedometer and clock, outside temperature, economy and trip odometer and range. Toyota’s Entune system provides entertainment. In addition, Toyota’s Star Safety System is standard in all four grades. 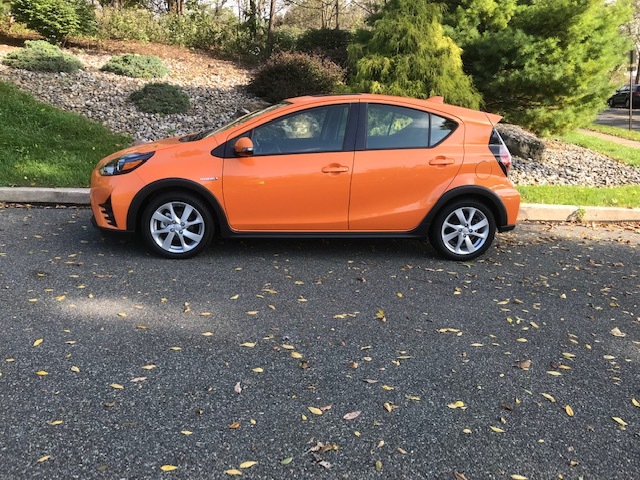 The Toyota Prius c shows its mettle with its compact crossover design, offering practicality plus utility plus economy in its last year. 2019 Green Cars of the Year Honors. Does the X1 deliver enough? The Armada is now on Patrol!! !